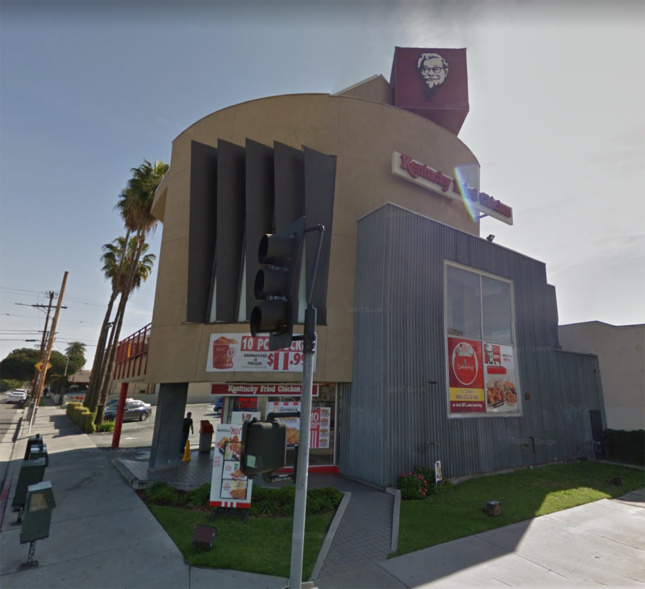 An iconic postmodern Kentucky Fried Chicken (KFC) outlet in Los Angeles has been severely damaged after a fire yesterday afternoon. Located on 340 North Western Avenue, in Koreatown, the restaurant suffered burns to its roof and walls. Los Angeles Fire Department spokeswoman Margaret Stewart told San Fernando Valley Media that 40 firefighters took to the scene, dealing with the fire in just over 30 minutes. No injuries have been reported; however, an investigation into the cause of the fire is still underway. The KFC was formerly run by Jack Wilkee, who took on the franchise to make changes to the restaurant, which he operated for 25 years. To make such a change, Wilke, an art collector, sought the expertise of local architect Elyse Grinstein, who he knew from his art circles. Grinstein’s influence, exhibited in her charred work, comes from Frank Gehry, her former boss, and Michael Graves, who was Grinstein’s student when she was a teaching assistant at the University of California, Los Angeles. 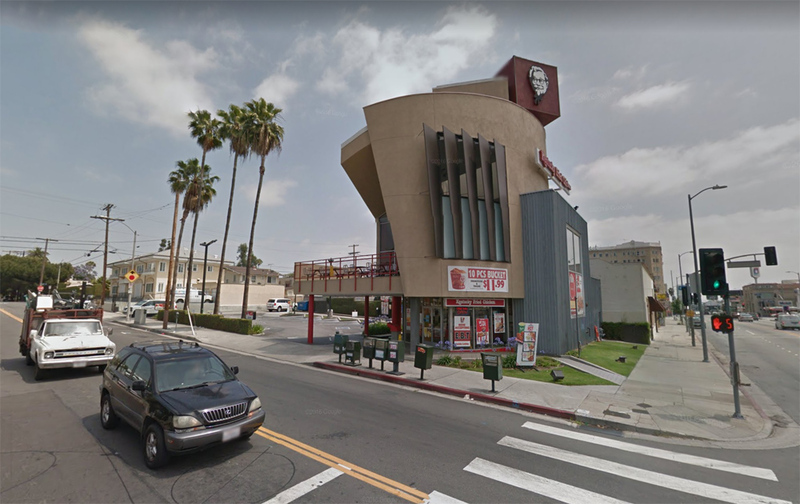 Wilke enjoyed Gehry’s overtones that carried through in Grinstein’s architecture so much so that he let her have free reign with the KFC’s design. “I turned the design over to her, and let her have her head,” he said. As a result, Jeffrey Daniels, Grinstein’s partner and colleague at the Culver City practice Grinstein/Daniels, produced the Koreatown icon that many know today. 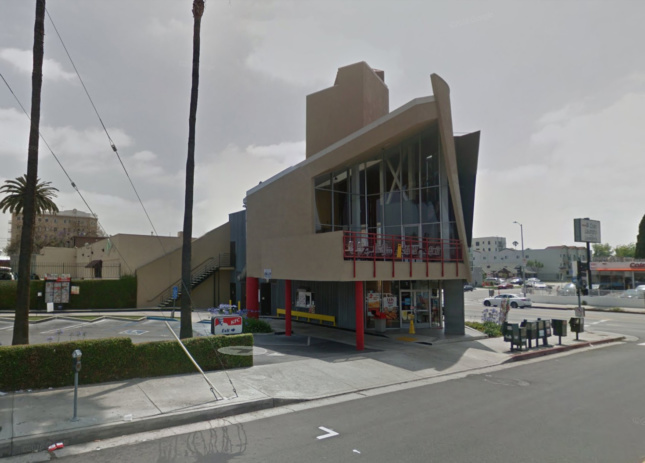 “Jack (Wilke) wanted to do an updated Googie KFC,” Daniels said, “but we convinced him to take it one step further and reinterpret the 1950s diner style in a more sophisticated 1990s idiom,” Daniels said, also speaking to the L.A. Times 27 years ago. The design may have been the first KFC to break the formal mold that had been a precedent for KFC’s before, but it certainly was not the last. Also in California, the Palm Springs KFC dons a Googie aesthetic. Meanwhile, in Georgia, the Marietta “Big Chicken” (which became a KFC franchise in 1991) sports a 56-foot-tall steel chicken, complete with a moving beak. The much-loved roadside restaurant recently received $2 million makeover.